Moore, Michael Nyman, UB40, 10CC and Simple Minds. Each contains 5 albums by the relevant artist, so in the case of Simple Minds that's "Sparkle in the rain", "once upon a time", "Real life", "Street fighting years" and "Good news from the next world". Five albums in one release sounds good, but the best part is the price - they're available for around £15 so you get 5 albums for the price of a new chart album. 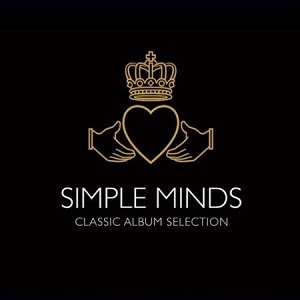 The Simple Minds release comes like others in the series in a box case, with each album being in it's own gatefold sleeve, with all the sleeves illustrated with the original album artwork. It's very nicely packaged - good quality packaging and still fairly compact. The only thing missing really is a CD booklet - it would be nice to have something included with a biography of the band, information about the albums etc, but to be honest that would just be a bonus - getting five great albums for £15 is a good deal. The choice of albums included in this release is interesting. You've got the five albums they released from 1984 to 1995 - "Sparkle in the rain", "once upon a time", "Real life", "Street fighting years" and "Good news from the next world". Three of these were UK number one albums, and the others reached number 2 in the album charts, but I'm surprised that the album "New Gold Dream (81/82/83/84)" wasn't included instead of "Good news from the next world", especially since "New Gold Dream (81/82/83/84)" had more commercial and critical success. A six album release would have made more sense as it would have allowed "New Gold Dream (81/82/83/84)" to be included alongside the albums already included, and as such would have covered all the albums from the band's commercial peak. That aside, this release is packed with great songs - there are a dozen or so songs that were released as singles and made the Top 30, including 6 top 10 singles and one Number one (Belfast Child, released as the "Ballad of the streets EP"). Even ignoring the songs that got released as singles these albums are really strong. Before I started listening to this classic album selection I'd forgotten just how many great songs the band had released, and that's a nice thing about these releases - you take a break from the latest releases and go back and listen to some classic songs from the 80s. Of the albums included, "Good news from the next world" is certainly my least favourite album - it's not a bad album, but when you compare it to the other albums here then it doesn't stand up well to the comparison, and that's the problem. In contrast, the first three albums here are superb, with "Real life" close behind. Many fans of the band will have all these albums already, but others may just have one or two and if that's the case then this is a great value way to get the others. Many music lovers though won't have any of these albums, but will know the band through it's singles such as "Alive and kicking", and it's people like that who really should consider buying this release - there is more than enough great music here to justify the price.